My, how the casino world has changed. Take a look at the original Ocean’s 11 movie and you’ll see a cast of casino patrons wearing suits and otherwise fancy attire. 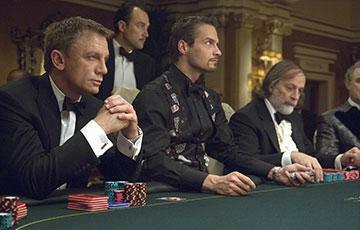 Back then, a night at the casino was a night to remember. You didn’t just jump in the car and grab your wallet. You spent hours getting ready. You picked out your attire well in advance. And when you walked through the doors, you were dressed to turn heads. But today, things are different. Take a look at movies like The Hangover or 21 and you’ll realize that stained t-shirts, shorts, and flip flops aren’t just the norm, but in some cases they’re actually acceptable. Yes, dress codes at casinos have deteriorated. It’s not just a case of the casino industry changing, though. It’s a case of the evolution of culture. A night out at the theater, for example, used to involve dressing up. Now it’s common to see audience members in jeans and baseball hats. But have casino dress codes really deteriorated all that much? Is every casino around the world really that welcoming? Is there any place that has restrictions? Today, we’re travelling the world to find out. At Resorts World in Singapore, things aren’t as casual as you might think. If your face is concealed in any way, you’re barred from entering the casino. That doesn’t mean just wearing sunglasses. Nor does it mean wearing a balaclava, which would probably get you arrested at any establishment that deals with large sums of money. It also means wearing a hat. Yup, if you enter the casino wearing a baseball hat, or a hat of any other kind, you’ll be asked to remove it or vacate the premises. What’s more, shorts or slippers are not permitted. The verdict is still out on flip flops, so we’ll keep you posted. The original O’Sheas was quite something to see in Las Vegas. Old, dirty, and run down, the casino had its very own Burger King in the back. While that might have been out of place at any other Las Vegas casino, it felt right at home at a casino where a beer pong table felt right at home next to a $1 Casino War table. They tore down O’Sheas a few years ago and rebuilt a smaller version as part of the new Linq complex. The new O’Sheas as cleaner and nicer, but still really casual. It’s essentially an Irish pub with a casino mixed in, and because the casino tries really hard to be that perfect Irish pub, casual clothes are definitely welcome. But not just any casual clothing. If you’ve got a “Kiss me, I’m Irish” t-shirt or anything with a 4-leaf clover on it, you’ll fit right in at O’Sheas. Same goes for big green glasses and anything that screams, “It’s St. Patty’s Day and I’m plastered!” no matter what day it actually might be. There aren’t a ton of restrictions at this casino located just on the other side of Ottawa, Canada, the nation’s capital. But you’ll want to leave your hat at home. Baseball hats are not permitted, not just at the tables, but also on the casino floor. This isn’t really listed on the website, but I speak from experience. That said, it might have been the fact that I was wearing a Toronto Maple Leafs hat in Montreal Canadiens territory. If you’re visiting Venice in the summer months and you happen to be wandering around in shorts and a t-shirt, you might want to skip Casino di Venezia. The world’s oldest casino still adheres to old-school dress codes. Men are required to wear jackets on the casino floor (with the exception of the slot machine area). If you don’t have one, don’t sweat it. You can grab one for free before you enter the casino. Of course, you’ll have to return it. There is no specific dress code listed for women, but we recommend dressing as though you were going for a nice dinner out. A nice top will do along with a skirt or a lovely pair of slacks. Skip the tourist t-shirt and shorts, if that’s your thing. If you’re in Monaco, there’s a good chance you either have a lot of money to burn or you burned all your money on a once-in-a-lifetime vacation. Either way, you don’t want to stand out from the norm in this opulent paradise. And the norm is definitely not a t-shirt and a Honda Civic. We’re talking designer suits that cost tens of thousands of dollars and t-shirts that cost a minimum of $500, likely made from imported cotton from an island reserved for the uber-rich. And that ubiquitous civic is replaced by Bentleys and Maseratis, which are essentially the car of choice for Monaco’s lower class. So when you step inside Casino Monte Carlo, you’ll want to look the part. That means no shorts and sandals. And definitely no t-shirt, no matter how designer it might be. Jackets are only required after 8pm, but we recommend wearing one anyway if you don’t want to stick out like a sore thumb. Rather not get dressed at all? Silver Oak Casino is your best bet. We’re an online casino, which means you can play for free from the comforts of your own home wearing whatever you want. Prefer to play in pajamas? Go for it. Prefer to wear nothing at all? We don’t judge (just keep your blinds closed). You can grab a free Silver Oak Casino account in a matter of minutes. So create one and play your favorite games for free, no dress code or deposit required.